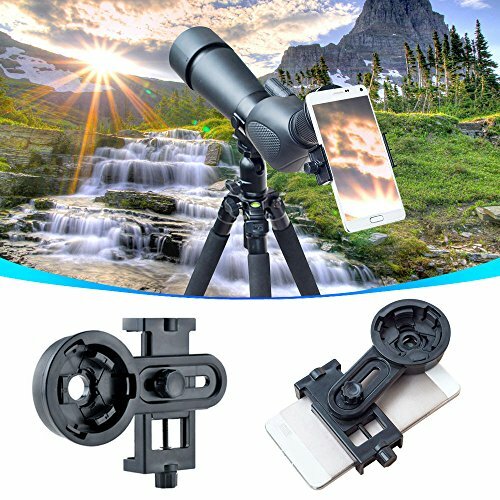 This large universal Phone adaptor is purposely made to mount Smartphone on to spotting scopes or telescopes so that you can take pictures or video footage through the scope. This is done by mounting the phone to this adapter and then clamping this device to the eyepiece of the scope. The item can be compliable with microscope, telescope, binocular, monocular andnightvision spotting scope. Fit eyepiece diameter 26.4MM-46.4MM. Not fit 2inch eyepieces. Adjustable clamp - With super large width range:55MM-98MM, Fit iphone 7, 6plus, 6,5s,5, Samsung, Sony, Sony Xperia Z and many other brands.This part can separately mounts on any standard tripod (1/4-20). Easy Installation - Just need to place the phone lens just right to line it up on the scope's lens. EVA Pads - Phone is well protected by High density EVA pads and nothing contacts your phone's screen. Durable metal materials - Made of high strength PA plastic and Aluminum. One time purchase for long-term use. Compact and Light Weight - 82g (2.89oz). Note: Please make sure that the outer diameter of the eyepiece is between 26.4MM-46.4MM(1.03"-1.82"). Compliable with telescope, binocular, monocular, nightvision spotting scope.Fit eyepiece diameter 26mm-46mm. With super large width range:55-98mm.Fit for almost smartphone sunch as iPhone 7/6plus/6/5s/5,Samsung and many other brands. Easy Installation.Just need to place the phone lens just right to line it up on the scope's lens.Can mount on any standard tripod. Safe and comfortable.The outface to connect phone and eyepiece are covered by soft material.Keep your device from scratch and damage. Allows you to take high-resolution snapshots of the moon, planets, constellations, and even some bright deep-space objects with this multiphone kit. You can also connect your phone to a microscope eyepiece with this adapter, explore the nature of the micro word.